Tbilisi Mayor Kakha Kaladze has presented a new transport policy, which is focused on defusing traffic jams and reducing air pollution in the capital. The policy also aims at ensuring safe movement of the pedestrians and the development of public transport. It envisages reduction of private vehicles use and improving public transport services in the capital. Kaladze says that old yellow buses will be replaced by new, EU standard blue buses in 2018-2019, adding in 2020, the number of buses in the capital will be increased to 900. Currently, there are 816 buses in the capital, out of which 143 are blue. Transport policy and challenges in this direction are one of the most important tasks for our city. The transport is there to serve people, and not to create problems for traffic and health. Each of us is aware of the ecological situation and air pollution problems,"Kaladze said. He said new 12 carriages will be added to the metro trains to reduce the waiting intervals between the trains. 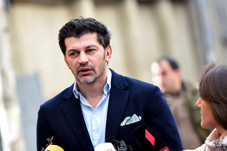 “Our priority is to develop public transport, increase its consumption and simultaneously reduce the number of private vehicles, "said Kaladze. The Mayor thanked the Prime Minister, the government and parliament for their support. “The implementation of the new transport policy is directly connected to large amount of funds. I would like to thank our PM and the government for their support,” he added. The Vice-Mayor Irakli Khmaladze explained that the new transport policy also envisages mandatory registration of taxis, adding starting 2019, specific regulations will be activated regarding the right-hand vehicles and color of taxis. From the first half of 2019, the pilot program of parking system will be launched in several central districts. The aim of parking regulation is to manage the traffic flow. For the same purpose, there will be installed smart traffic lights, which will collect data and serve to better managing of traffic movement. The Prime Minister Mamuka Bakhtadze also delivered a speech at the presentation. He said the government decided to allocate important financial resources from the central budget of the country to change the Tbilisi ecosystem in the nearest future, including the transport system. “The new transport policy will significantly contribute to implementation of Green Economy concept, which I will present in a few days,” Bakhtadze stated.